For scientists, data-sharing and reuse offers new opportunities for collaboration and discovery. This practice raises questions about how colleagues interact, how to harmonize data from multiple sources, and how to integrate new data inputs (Rolland, 2016). Despite these challenges, collaboration and reuse allow individual researchers to investigate questions that would typically have been met by larger teams. In design and allied fields, the rise of 3-D sensing and printing technologies are opening new ways to reuse geometric data. Voxel Harvest introduces a new manufacturing platform to support multidisciplinary design collaboration. Using authored and automated image data-sets, this system allows teams to synthesize architectural components with high-resolution textures and micro-structures. 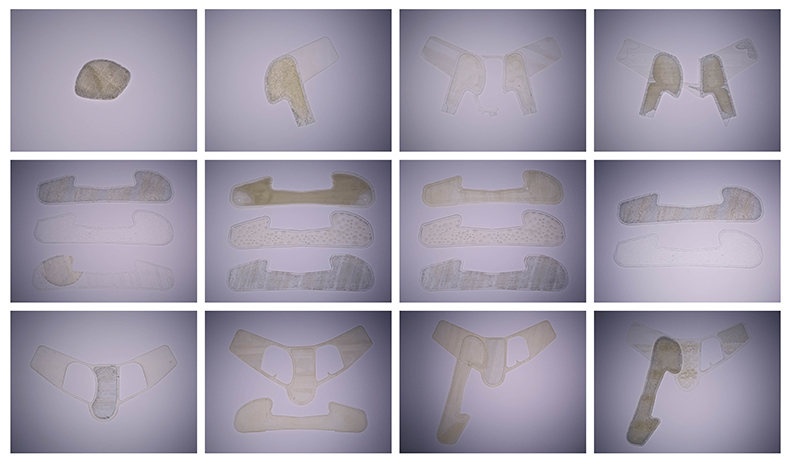 As a proof of concept, a design project combining design and medical datasets applies these techniques to the design of an orthotic device. By combining specific patient data with best practice diagnoses from a podiatrist, a design team used geometric libraries and generative algorithms to program a bio-device for the patient’s recurring injury. A workflow emerged where a new class of custom products could be created through digital manufacturing. We defined a behavioral program based on four factors: shape, microstructure, texture, and pneumatics. We employed shape to define holistic function, controlling fit through position and pressure. To optimize fabrication, a primary objective was to print two dimensional patterns which folded up into three-dimensional devices, much like how footwear is made. With voxel printing we can embed complex microstructures within a material to control how and where a shape will behave. For instance, dense structures are rigid, with a higher modulus of elasticity, while open structures deform easily and return to their original shape slowly, if at all. Grid structures reduce movement along axes perpendicular to the grid while circular structures condition movement by pattern size in all directions. In regard to shape, grid structures proved useful in programming structural areas where pressure needed to be increased, circular structures in areas that required more expansion. Texture not only controls somatosensory experience but augments thermosensation (human perception of temperature) with textures that wick condensation, provide insulation, or allow heat transfer. For example, effective cold therapy is defined at a range of 35-50 degrees Fahrenheit, and material properties can be designed to fit patient needs and allow transfer at very specific temperatures defined by the chemical properties of the cooling agent. Voxel Harvest is suggestive of a new field of multidisciplinary design and manufacturing based on data sharing and reuse. This work illustrates model libraries, scan data, and generative algorithms can be harmonized within a common design and manufacturing platform to realize a previously unobtainable class of custom products. Such methods are destined to transform a variety of critical fields, from biometrics to sports medicine, prosthetics, and bio-devices, and ultimately healthcare delivery and human performance. 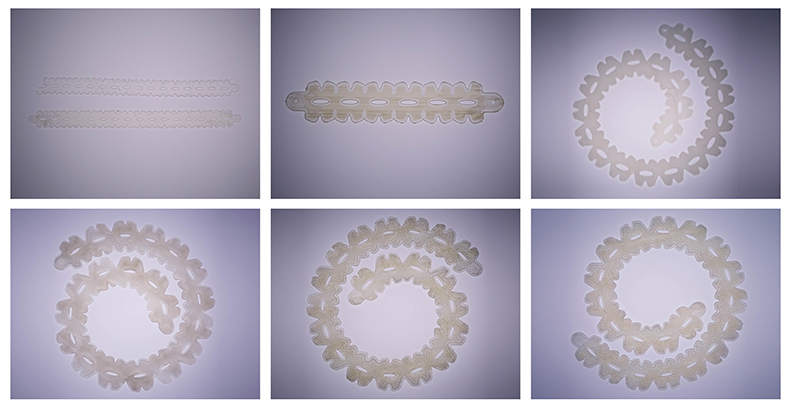 Voxel Harvest points to a new field of multidisciplinary design and manufacturing. Disparate datasets can be harmonized to realize a previously unobtainable class of custom products. Further research will transform critical fields, from biometrics to sports medicine, prosthetics, bio-devices, and ultimately healthcare delivery and human performance.